Because Cambridge Assessment English is a part of millions of people's daily learning process and is a dedicated, passionate collaborator with hundreds of thousands of teachers and study centres worldwide. The exams guarantee a solid and continuous learning process, step by step, from school to the workplace.Cambridge English offers teacher training including hundreds of seminars each year as well as lots of free resources to support both students and teachers. Experience speaks for itself: Over 40,000 teachers, 6,000 study centres, dozens of institutional partnerships, consultancy for numerous bilingual programmes and a myriad of candidates who began their learning path with Cambridge English. Recognised by over 20,000 institutions in 130 countries: Thousands of universities, colleges and other educational institutions around the world use Cambridge English exams. Gain real-life communication and language skills for study: Stand out from the crowd by showing you have the real-life language skills necessary to make the most of studying, working and living in English-speaking places. Prove that you have the right language skills to succeed at university: Educational institutions value and rely on Cambridge English exams because they thoroughly test all four language skills (reading, writing, speaking and listening). Preparing for your exam will help you develop the skills needed for success at university. Increase your chances of getting the place you want at university or college: If you can show you have an internationally recognised qualification in English, you will have a greater advantage when applying for a place at university or college. Increase your future employment opportunities: Employers across the globe accept Cambridge English qualifications for recruitment, so you will improve your chances of getting your dream job. Gain a qualification that can be used for visa applications: There are 13 Cambridge English exams that can be used for UK visa applications. 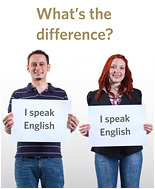 Cambridge English exams can also be used for visa applications to Canada and Australia. Cambridge English examinations have a long-established and well-deserved reputation for excellence. Over 5 million people in 130 countries take the exams every year: It is essential to the quality of the exams and the continued reputation of Cambridge English, that each one of those candidates experiences a test that consistently meets the high standards set. 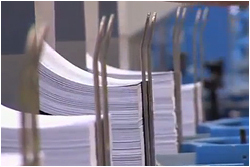 The exams are specifically designed to be fair to all test takers, whatever their age, gender, nationality, first language, culture or ethnic background. ...or if you prefer you can download the document to share with your students and their parents. The exams are linked to the Common European Framework of Reference for Languages (CEFR), published by the Council of Europe, making simple for employers, universities and other organisations to specify levels of language ability and easy for learners to choose the right exam. 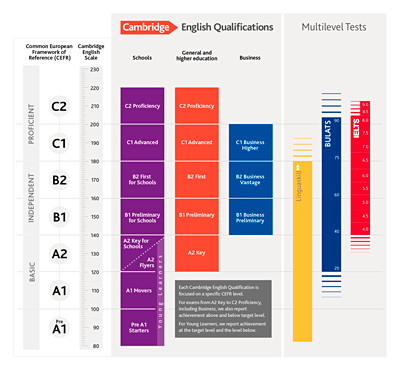 Cambridge Assessment English was one of the organisations involved in the early development of this language benchmark, wich is used internationally to describe language ability. 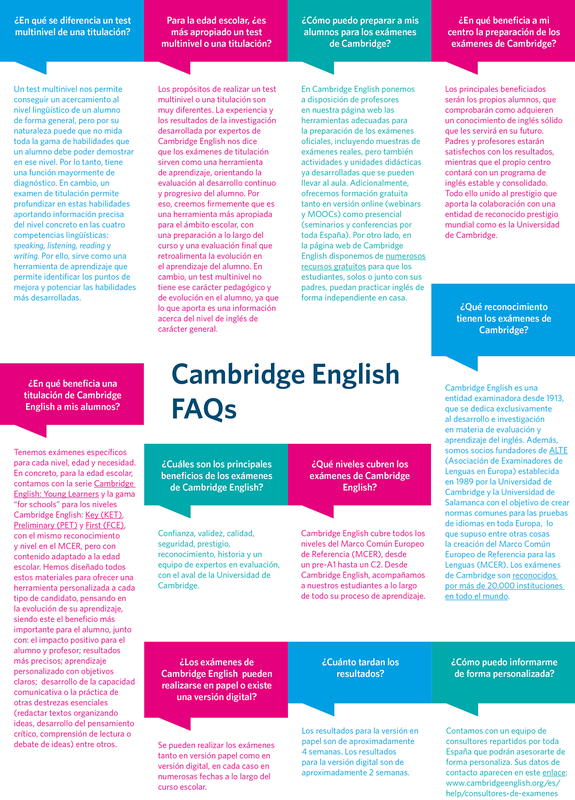 Cambridge English remains at the hearth of the development of the CEFR through being a key partner in English Profile, a research programme that will further develop the CEFR, providing detailed descriptions of learner English at each of the six levels.